A girl standing on the sidewalk was struck by an out-of-control motorist when two drivers collided at 26th Street and Oak Street (where it turns into Virginia Avenue) in the Park Hill neighborhood. One driver fled the scene and the other was arrested. The incident, which took place Wednesday, March 9 at 3:00p.m., was reported by WAVE3. 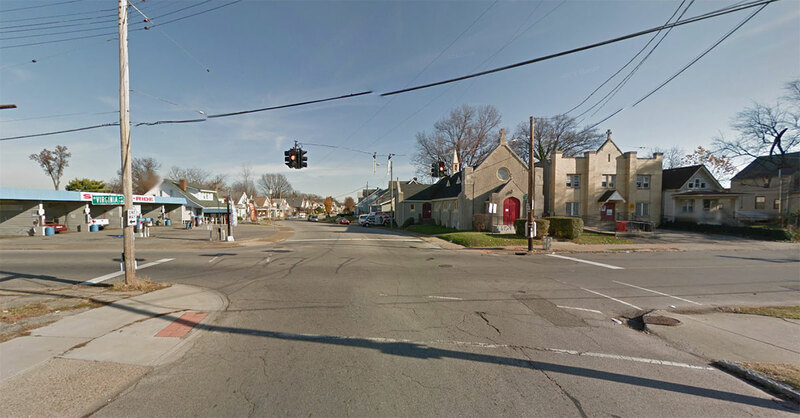 The intersection is signalized, suggesting one of the motorists may have run a red light, and both 26th Street and Oak Street / Virginia Avenue carry 35 mile per hour speed limits, despite the fact that they both traverse predominantly residential neighborhoods. The crash site is a block north of Johnson Traditional Middle School. The motorist operating the Trailblazer, 23-year-old Keylandance Carpenter, had outstanding warrants, Brown reported, and was charged with driving on a suspended license and giving a false name. The child was taken to Kosair Children’s Hospital with non-life-threatening injuries. The Louisville Metro Police Department (LMPD) is asking anyone with information about the hit-and-run motorist to call its anonymous tip line at 502-574-LMPD. Louisville is currently in the midst of a three-year pedestrian safety campaign called Look Alive Louisville. The federally funded program is in response to the city’s above average pedestrian fatality and collision rate. Make Oak two-way all the way. Not a cure for reckless but might make wrecks-less. A two-way street would not have made a difference if the suv traveling west was hit by the vehicle traveling north. The issue again is the zero setback and obstructive bushes on the southeast corner, the rest of the buildings at the intersection are set back enough that gives a larger line of site for the oncoming traffic, imagine you are traveling south on 26th, you could see further east on Oak. Another dangerous intersection is at 18th and Oak, zero setback, where the Dollar General obstructs the traffic line of site to the east, if you are traveling north on 18th. 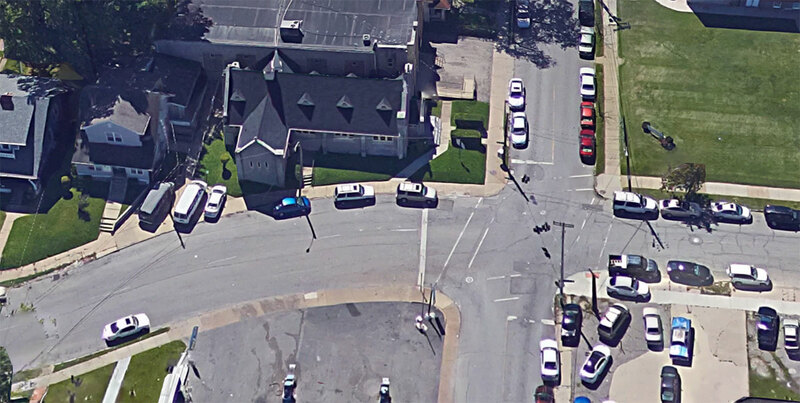 My opinion, buildings on corners should be set back far enough to allow drivers on the intersecting streets a larger line of site. Most of us obey traffic signals and laws, but there are those we have to watch out for and always drive defensively. When I first saw the story on the news, I assumed the man who was arrested was at fault, I was clearly wrong and have to applaud him for sticking around after the wreck. Yes he was driving illegally, maybe knowingly or unknowingly about the warrant, but decided that the condition of the child was the most important thing, the driver who left the scene, traveling north on 26th was likely at fault by t-boning the man’s suv and leaving the scene. Simply not caring if anyone was injured and likely the same situation of driving illegally. The real criminal and focus of the story is the person who could care less and left the scene.